As the international spotlight on COP15 decreases, the most challenging part of the process has just begun: the time for action and accountability, the time to learn the lessons, digest the vast amount of information shared, and identify synergies for coordinated action. This challenge is particularly relevant to emerging topics such as the role of ICTs in climate change. Although most of the attention on the role of these technologies in climate change has been focused on mitigation efforts, namely on their role to help reduce the carbon footprint, interest is increasing in their contribution to monitoring and adaptation. As an example of the growing momentum that these technologies are generating, an organisation called Resources for the Future launched the Global Adaptation Atlas during the Copenhagen event. 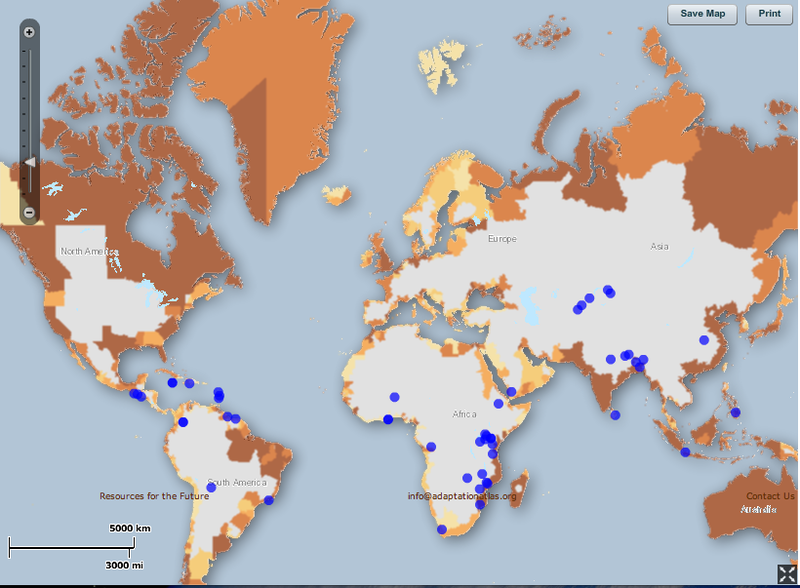 The Atlas consists of a dynamic mapping tool that allows the creation of maps reflecting climate change impacts. The data displayed focuses on the impacts of climate change in food, health, land, livelihood and water, all critical issues especially in developing countries. Beyond thematic impact, the map displays adaptation activities (information that can also be uploaded by users), including project description, funding and contacts, which can help to foster collaboration and avoid duplication of efforts. It also suggests the potential of innovative applications to inform and convey knowledge to decision makers, researchers and the public in general on key climate change threats. It shows us that ICTs can play a role in helping to reduce climate change uncertainty, and identify key areas of vulnerability. This can be particularly important to mobilize and motivate action at the local and national levels. Interesting initiatives that relate to the use of ICTs in climate change are emerging worldwide. It is now our task to share them, discuss them and learn from them, building on the momentum generated by COP15 to avoid key issues and gaps identified falling into the cracks of global action.